A new module site is created in Moodle for every module occurrence in SITS, and so it will be necessary to copy content from previous versions into new versions of the module. 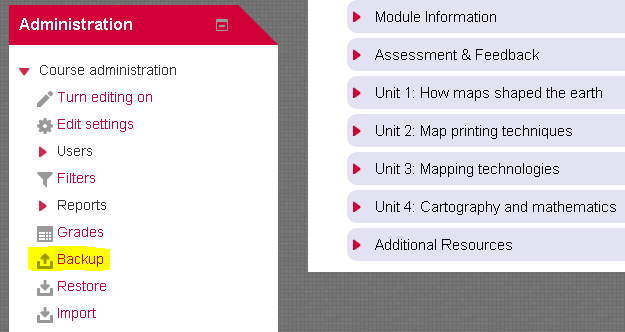 Similarly, if two modules (or programmes) are to be crosslisted, then any content from a ‘child’ course will need to be copied into the new ‘parent’ course. The two methods to copy content are Import and Backup & Restore. For help and support with your course content, contact your campus Learning Technologist. This is the method when copying content into an empty course. Click the import link and then select your course from the list or search for your course if you have too many in the list. Then follow the prompts to import the content. 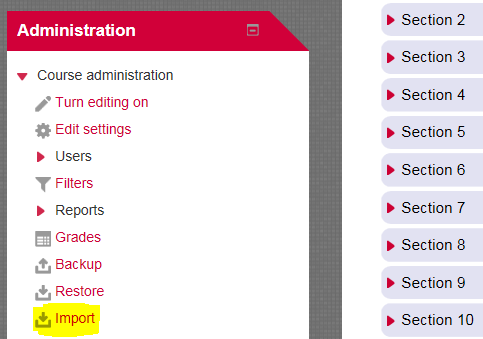 Note: imported Turnitin assignments should be deleted and new ones created. This method is used to completely overwrite existing content, or to copy content from courses from the Staff Training or Community Moodle servers. This method is also useful for copying individual items (eg. Books or Pages) from one course to another. 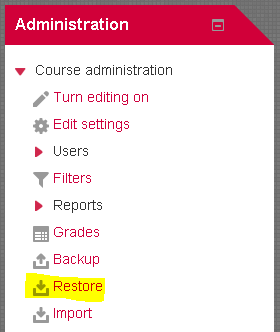 Click the backup link and select the course items to be included in the backup file. Follow the prompts to create the backup file and then download it to your computer. Now go to the course which is to receive the content and click the restore link. Upload the backup file and click the restore button, and then follow the prompts to complete the restore process.